ePublishing Knowledge BaseePublishing Knowledge BaseePublishing Knowledge Base Creating, Managing, and Selling Products How do I create discount codes or offers? 1.1. Under your navigation in your dashboard, click Create next to Offers in Sales/Marketing. 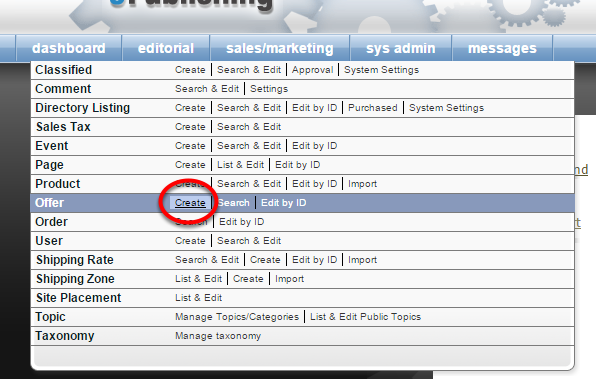 You may also search for and edit existing codes by clicking Search or Edit by ID. 1.2. Create or access offers or discount codes within a product. Zoom: Create or access offers or discount codes within a product. This process is a shorter version of the steps taken when you create an offer through the Offer Manager. When created within the product, the offer will automatically be associated with that product. You can edit the offer in the Offer Manager at any time. 2. 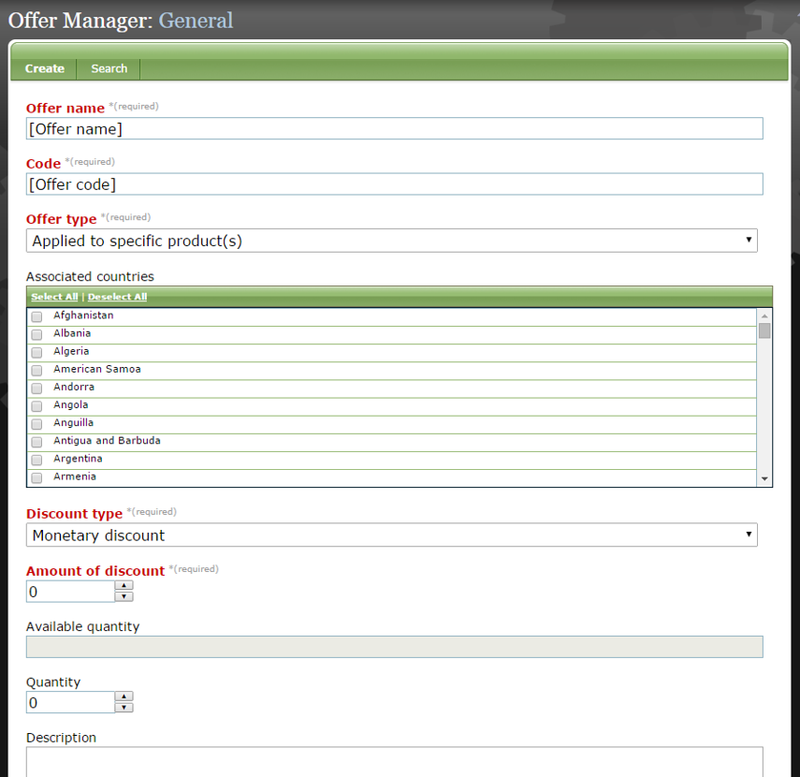 When you create a new offer through the navigation of your dashboard, you will be taken to the Offer Manager. Zoom: When you create a new offer through the navigation of your dashboard, you will be taken to the Offer Manager. 3. Add an offer name, which will be shown externally in the shopping cart after an offer code is used. Zoom: Add an offer name, which will be shown externally in the shopping cart after an offer code is used. 4. Create an offer code. This is what buyers will use to get their discounts. Zoom: Create an offer code. This is what buyers will use to get their discounts. Keep it simple, but distinct from other codes. 5. 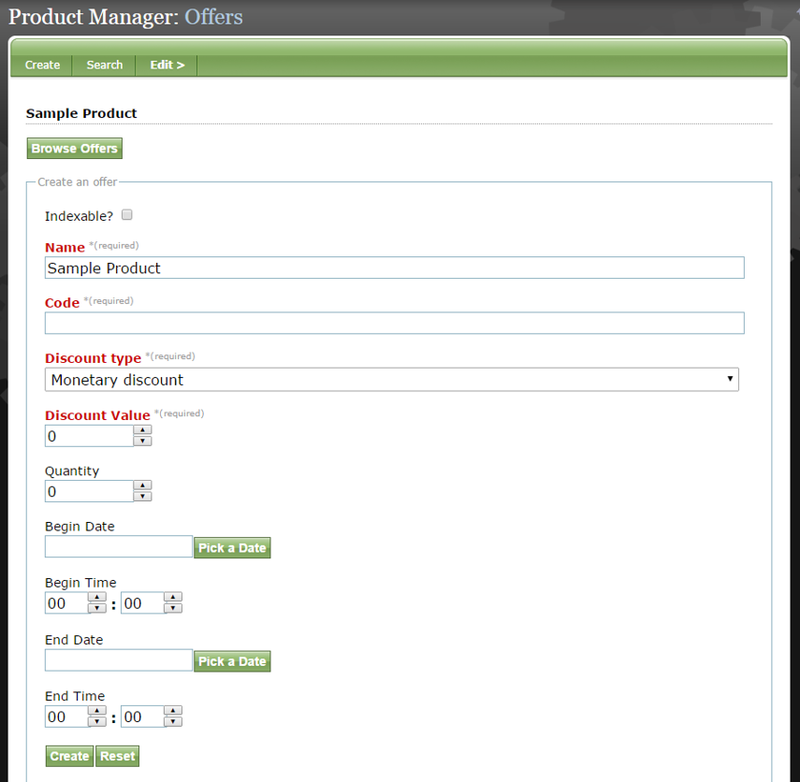 Decide whether you want your code to be applied to the entire cart or to specific products. Zoom: Decide whether you want your code to be applied to the entire cart or to specific products. This dropdown also allows you to select free shipping, which will automatically result when the buyer enters your offer code. If applied to a specific product, you will be asked to select which products that offer code can be used for. 6. Select a Discount Type. Zoom: Select a Discount Type. Monetary discount will discount the product by a fixed dollar amount. Percentage discount will discount the product by the percentage you set. In the case of a Percentage Discount, 10 represents 10% off. In the case of a Monetary Discount, 10 represents $10 off. 8. Set a maximum quantity. This applies to the number of times the discount code can be used by anyone, not just an individual user. Zoom: Set a maximum quantity. This applies to the number of times the discount code can be used by anyone, not just an individual user. 9. Add a description for your offer code, if desired. This is not required but may provide context for the code. Zoom: Add a description for your offer code, if desired. This is not required but may provide context for the code. You may add the text directly into the box, using HTML, or add it using the WYSIWYG editor. If you add just one line, no HTML is needed. 10. If desired, add Confirmation Text that can appear in the confirmation email. Zoom: If desired, add Confirmation Text that can appear in the confirmation email. 11. 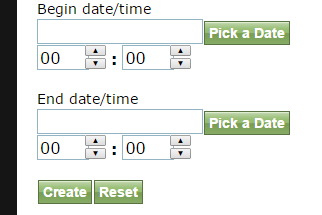 Limit the duration of your offer by setting a Begin Date/Time and an End Date/Time. For example, you may want to hold a 24-hour sale. If you'd like your offer to be good without limit, simply leave the End date/time blank. A Begin date/time is required to activate the offer code. 12. 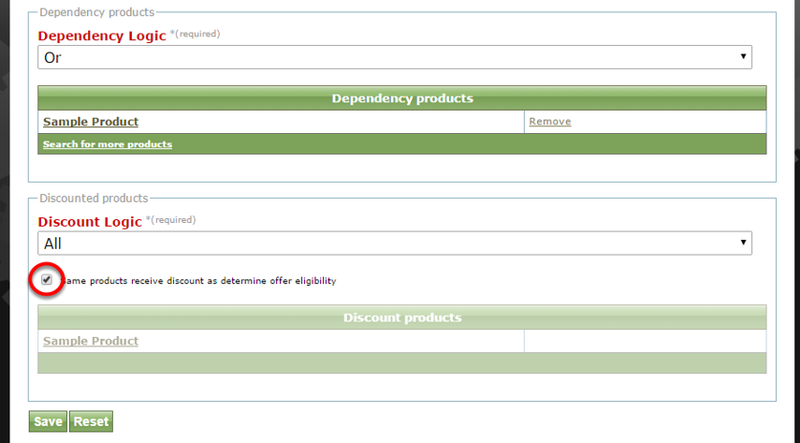 To associate specific products with your offer code, click Product under Edit. 12.1. Under Dependency Logic, click on "Search for more products." 12.2. Select the checkbox next to the product you'd like to associate your offer with. Do NOT click on the product link itself. Zoom: Select the checkbox next to the product you'd like to associate your offer with. Do NOT click on the product link itself. 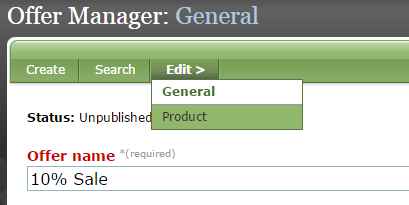 After selecting your product or products (1), click Confirm Selection (2). 12.3. If the discount is not dependent on any other purchases, under Discount Logic, select the checkbox next to "Same products receive discount as determine offer eligibility." 13. To make your offer contingent upon other purchases, select the product the discount applies to. Zoom: To make your offer contingent upon other purchases, select the product the discount applies to. 13.1. 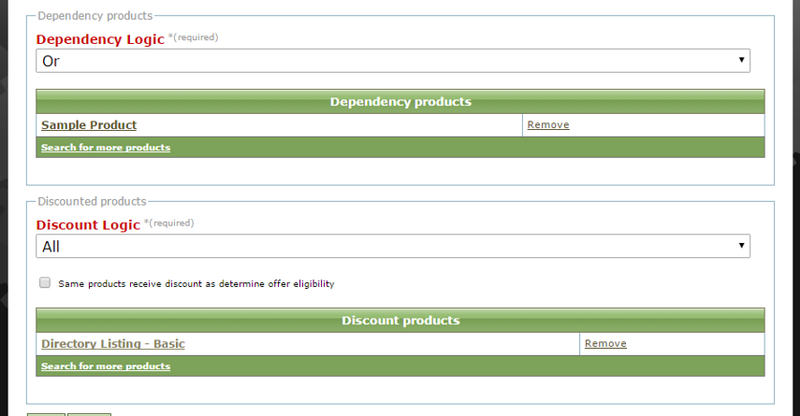 Select either All or Any in the dropdown under Discount Logic and select the product or products the discount is based on. Zoom: Select either All or Any in the dropdown under Discount Logic and select the product or products the discount is based on. Any: If any of the products are chosen by the buyer, he will receive the offer. All: Only if all of the products are chosen by the buyer will he receive the offer. For example, buy these three books and get a CD for 50% off. 13.2. For example, if someone buys a Basic Directory Listing (as shown), he will receive a discount on the Sample Product. Zoom: For example, if someone buys a Basic Directory Listing (as shown), he will receive a discount on the Sample Product. 14. Your offer is ready to go. Return to the general screen and click Publish. Zoom: Your offer is ready to go. Return to the general screen and click Publish. We recommend you test the offer in your store to ensure it is set up correctly. Prev: How do I use metering, which allows readers to access a set number of articles for free before paying? Next: How do I create bulk or quantity discounts for products?